There are a lot of really incredible things about living in south Florida--the weather, the cultural variety, the food, the fact that you can be cursed at in traffic by fifteen different people in thirty-five different languages. There's even a decent local music scene, if you look for it hard enough. Yeah, that's right. The big act that Ticketmaster is excited about this month is Joe "Is She Really Going Out With Him" Jackson. 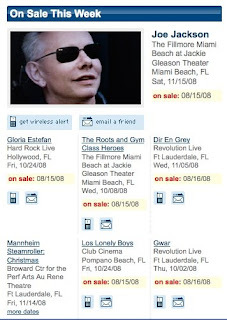 Gloria Estefan fits into the "local star" category, and then the rest are Los Lonely Boys and The Roots, neither of which I'd mind seeing, and Gwar, which might have been funny 15 years ago, but not today, at least, not for me. And Mannheim freaking Steamroller. Well, it is south Florida, once known as "heaven's waiting room." They'll probably sell out in an hour. Here's this week's Random Ten. Hopefully my snarkiness toward the live music options hasn't resulted in a karmic backlash of epic proportions. Here we go. Yes, that is a mighty schizophrenic random ten, to be sure. Leave yours in the comments.